All about what we do and why we do it at Cloudways. Managed digital experiences for agencies, SMBs and individuals. Pay as you go plans that work for your business. A complete WordPress hosting solution built for high growth brands. Earn commissions with our flexible affiliate plans. Build, grow, scale and expand your startup with us. Grow audience with us and discover new revenue streams. Expand your marketing reach for more brand exposure. Affiliate marketing has come a long way since its inception, developing from conventional methods and currently ruling in the form of email marketing and social media platforms. It has been a subtle transition yet quite productive in terms of sales. Thus, attracting a lot more people to begin product based affiliate marketing as their side or in some cases, as their main business. However, how to promote affiliate products on social media remains a real challenge for many people. However, being a successful affiliate is not as easy as signing up for an affiliate program. It’s a tiring process and requires a well-thought-out strategy, particularly when it comes to affiliate marketing on social media. Beginners may find it difficult to spread the word or reach the right platform, but that’s where this article is going to help them. Here is a quick guide to carry out affiliate marketing on social media. Follow these strategies to drive good volume of sales and earn as much as you can. 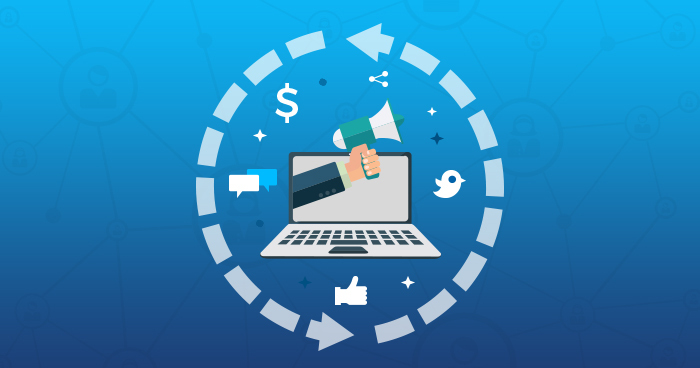 Popular social media websites such as Facebook and LinkedIn are some of the best platforms to promote products as an affiliate. You can browse for groups that are closely related to the niche where your product lands at. These groups are one of the most effective ways to increase the product’s reach in terms of organic audience. Moreover, there are various online communities that promote high paying affiliate products of all sorts. These communities and groups are a great way to reach the right audience and make your product known, it will eventually be a plus for your marketing campaign as well. Additionally, these kinds of groups have a great chunk of marketers that you can refer to affiliate programs for added commission. Now how do you look for a specific group? Let’s say you’re into cloud hosting business, so you should search for groups that are related to web designing, web development, web hosting, etc. This way, you will be able to convey your affiliate store to the right audience without any monetary effort. Community marketing is gaining pace because of its rapid results. The question that often arises is what exactly is a community? Simply put, a group of people related to your niche is a community and your target market as an affiliate. To boost up your product’s sales, you have to build a profile that influences people within the community. Profile building is perhaps one of the most interesting and crucial part for a business. Where a good profile rakes in positive reviews, a bad profile affects business negatively. The success of an affiliate marketer primarily depends on the credibility and reputation of the product being marketed in both, online and offline communities. Keep an eye out for products with good community profile since they are likely to sell easily. Apart from selecting the right product to be an affiliate for, as a marketer you need to have the right set of words while promoting your product. Affiliates often confuse content with sales pitch and that’s where things don’t work out well. An engaging blog that addresses news, updates and fixes about the industry where your product fits, is another way to reach the right audience. Customers looking for industry-specific news are more likely to stumble upon your website and hence catch a look at your product as well. To emphasis on the importance of content, consider taking a look at the world’s biggest beverage company, Coke that has a blog up and running by the name of “Unbottled”. Brain works with images and that is why you should specially emphasize on graphical representation when it comes to working as an affiliate marketer. Linking product images in your content is one of the best marketing practices and consumers are more attracted to a product or service after getting to see it. Additionally, social media platforms have higher reach and engaging rate for images. It can’t be emphasized enough that product images are the key factors when it comes to closing a deal. Moreover, marketers are advised to include product images with ad copies that they promote on social media platforms; this helps creating higher engagement level. Consider affiliate marketers of Amazon and Ebay, they merge product images and specifications with their content to increase the probability of sales. Lengthy affiliate links and URLs are less appealing to users, this is why cloaking affiliate URLs is a popular practice among affiliate marketers. All you need is a URL shortener tool that will make your affiliate links look more concise and attractive. The biggest plus of shortened URLs is that they are more likely to get shared. Short URLs are more manageable on social media platforms. Compressed URLs have high click through rate and are also feasible for compiling click data for affiliate links that helps analyzing interest of the audience. For example, Bit.ly, Goo.gl, Owl.ly, are some of the most popular URL shorteners used by affiliate marketers. Anything that is overdone is of no use and same is the case with promoting any affiliate product, service or program. To survive in the world of affiliate marketing, you need to be on the hunt to promote offers or products that have potential to sell like hot cakes. Discount offers, seasonal campaigns or outstanding products should be promoted regularly and other than that, an affiliate marketer should not be overdoing things. This practice affects the credibility of the affiliate as well as the platform that is used. Even though affiliates can easily sign up and promote anything among their circle, but supporting an unappealing offer is no different than starring in a movie that you know would flop. Life of an affiliate is not a walk in the park, however, social media has made it comparatively easier. It has become a great source for marketers to spread the word about the products or services they cheer for. The aforementioned guide is all that it takes to form a well-thought-out strategy that can help you become a successful affiliate marketer via social media. I hope you now know how to promote affiliate products on social media. If you liked this article you might like our another article on: 7 Habits Of Successful Affiliate Marketers. And do share your thoughts and suggestions about this article in the comments below. Tahha Ashraf is a Digital Content Producer at Cloudways, a Managed Cloud Hosting Platform. He loves talking about brands and writes content related to online marketing. He is fond of creativity and writes poetry in his free time. Start Growing with Cloudways Today. Be the first to get the latest updates and tutorials. Why Affiliates are Getting Clicks But No Conversions? Choose the best Managed Cloud Hosting experience for your business! designers who get our content first.